tags: Prepare to cross the line. Fighter navigator Chris Burnett wants out: he was looking for something more than the boring recon missions he's been flying. He finds himself flying the lone Christmas day mission over war-torn Bosnia. But when he talks pilot Stackhouse into flying slightly off-course to check out an interesting target, the two get shot down. Burnett is soon alone, trying to outrun a pursuing army, while commanding officer Reigert finds his rescue operation hamstrung by politics, forcing Burnett to run far out of his way. Lt. Chris Burnett has lost faith in his job in the Navy and wants to get out, and is even forced to do a reconnaissance mission with his friend Lt. Jeremy Stackhouse over Bosnia. During the mission, they fly their jet off course to check out a suspicious target that turns out to be the site of a mass grave that contains bodies of Bosnian Muslims. The main perpetrator of the massacre, Gen. Miroslav Lokar, has the plane shot down in order to avoid having the plane obtaining evidence of the massacre. Stackhouse ends up getting killed, while Burnett finds himself alone on the run from Lokar's ruthless soldiers. Burnett's commanding officer, Rear Admiral Leslie Reigart, has trouble gaining approval from his own commanding officers to carry out a search-and-rescue mission to save Burnett. From encountering a major battle in a war-torn town, to mine fields, to Serb soldiers seeking the pilot, and to a highly skilled sniper, will Burnett be able to escape Bosnia, or will he suffer the same fate of his comrade? Can't tell much about the movie, other than the camera will not settle down. For those persons subject to motion sickness, this is unforgivable! The camera keeps moving for no reason, it does not enhance the plot, it does not make the movie better. Perhaps it is designed to keep your attention off the bad script and acting, like ET did with all the LOUD music. I had to leave because the movie made me sick and I could no longer view it. When will directors and produces wake up and learn that when the camera distracts the movie goers, it is not beneficial to the revenue? A Navy navigator is shot down over enemy territory and is ruthlessly pursued by a secret police enforcer and the opposing troops. Meanwhile his commanding officer goes against orders in an attempt to rescue him. 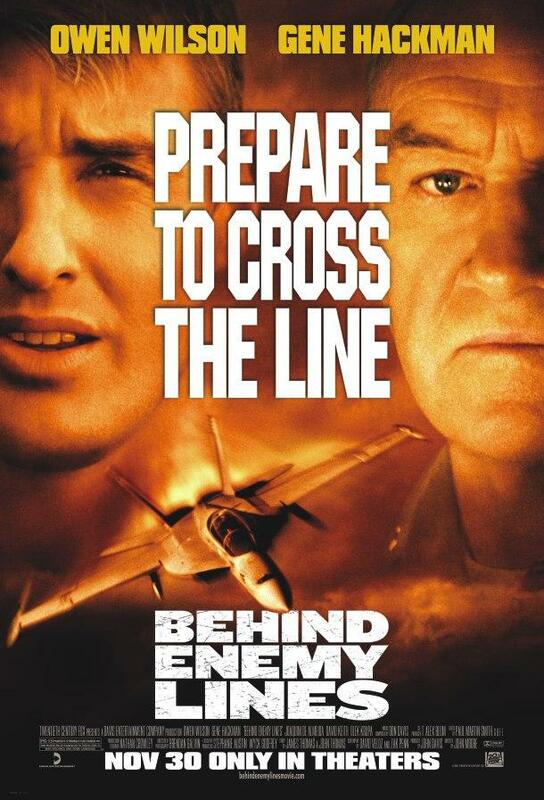 Behind Enemy Lines (2001) is an underrated Masterpiece that unfortunately was criticized cause of the Propaganda but it is truly a great movie and the Casting is perfect. 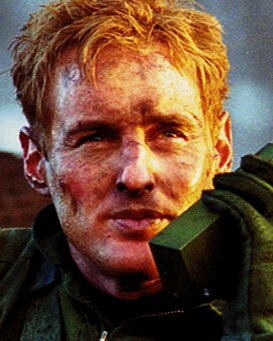 Owen Wilson gives an amazing performance as the main pilot who falls behind enemy lines and Gene Hackman once again is amazing as the commanding officer that tries to rescue him. The film is full of action and suspense from both aspects of the Pilot and the Commanding Officer because one tries to stay alive and the other tries to go against his commands and rescue the pilot. As i wrote in my summary the movie contains one of the coolest slow mo sequences ever and it's during the scene where a soldier stomps on a mine and slowly we start seeing him turning and turning as the explosion happens and it's truly something terrific for a movie that was made in 2001. Plus Owen Wilson has a moment of bravery where he kills a tracker in a spectacular way and then World War III basically starts once the Choppers come in. Overall this is one hell of a movie and like i just wrote it's just a "movie" don't take everything so seriously and hate it just because it's America and Propaganda it's one hell of an action film and an even better thriller/survival film. (A+) There aren't many better examples of how commercial intuition sabotages story integrity in today's Hollywood. When naval fighter navigator Lieutenant Chris Burnett (Owen Wilson) is shot down during an apparently successful cease-fire over Serb-held Bosnian territory while on a Christmas Day reconnaissance mission and his pilot Lieutenant Jeremy Stackhouse (Gabriel Macht) is summarily executed by Bosnian-Serb General Miroslav Lokar's (Olek Krupa) assassin Sasha (Vladimir Mashkov), Burnett is left to make his way alone to the rally point. Meanwhile, his commanding officer Admiral Leslie Reigart (Gene Hackman) finds himself in conflict with his superior officer, Admiral Juan Miguel Piquet (Joaquim de Almeida), when Reigart orders a search-and-rescue mission to save Burnett. Piquet fears that any attempt to rescue Burnett from behind enemy lines could throw Bosnia into more civil war, thus hampering NATO's withdrawal from the nation. Consequently, Burnett is ordered to make his way to a new extraction point in the friendly zone, a long and dangerous trek that takes him through mine fields, mass graves, and war torn Bosnian villages all the while being pursued by Lokar, Sasha, and their Bosnian-Serb forces. The film is based on a story by American screenwriting brothers James and John Thomas and a screenplay by David Veloz and Zak Penn. Behind Enemy Lines was followed by three unrelated sequels: Behind Enemy Lines II: Axis of Evil (2006) (2006), Behind Enemy Lines: Colombia (2009) (2009), and Seal Team Eight: Behind Enemy Lines (2014) (2014). The Bosnian War took place between April 1992 and December 1995 following the breakup of Yugoslavia. After Bosnia seceded from Yugoslavia, tensions between Bosnia's Serb, Muslim and Croat communities rapidly descended into war between these groups, with, at the height of the conflict, each side fighting each other. The Bosnian War gained international attention because of the numerous war crimes committed on all sides of the war. Growing concern over mounting atrocities led to international intervention, eventually resulting in a peace treaty that ended hostilities in Bosnia in December 1995. While Bosnia has remained at peace since the end of the war, lingering animosities between the country's ethnic groups have hampered progress at full recovery. During their reconnaissance mission, the duo unknowingly took photos of mass graves of the victims of Lokar and his men. Worried that the mass graves would be discovered and the crimes be traced to him, Lokar orders that the jet be shot down and that both Burnett and Stackhouse be killed in the hope that Lokar's crimes would not be exposed to the outside world. Just as the aircraft carrier is gearing up to leave the area, Burnett manages to reactivate the homing beacon on Stackhouse's ejection seat, alerting Reigart that he is still alive. Knowing that he will lose his command for going against orders, Reigart sends out a task force to rescue Burnett. Hot on Burnett's tail are Sasha and Lokar's second-in-command, Colonel Bazda (Marko Igonda), who have been following him. Along the way, however, Bazda steps on a landmine and is killed. Sasha catches up to Burnett, who is apparently shielding himself behind the ejection seat and prepares to outwait him until he hears the Search-and-Rescue helicopters approaching. He sneaks up on Burnett but realizes that he's been tricked as Burnett leaps out of a snowdrift and shoots him several times. Sasha shoots Burnett in the arm, and they go hand-to-hand until Burnett stabs Sasha in the chest with a flare, killing him. Unfortunately, the homing beacon has also alerted Lokar as to Burnett's position, and his tanks and infantry begin crashing through the trees. Burnett runs toward the helicopters, who begin firing on Lokar's troops. Rather than get to safety, however, Burnett runs back to the ejection seat in order to retrieve the hard drive containing the photos of the mass graves. In the final scene, Burnett and the helicopters land on the aircraft carrier amid cheers, and a written epilogue notes: Chris Burnett stayed in the Navy. The photographic evidence he recovered led to the arrest and conviction of Miroslav Lokar for numerous war crimes including genocide. Admiral Leslie Reigart lost command of his Battle Group. He was reassigned to an "administrative" job in Washington. He chose instead to retire with the respect and gratitude of the men and women under his command. No definitive reason is given during the movie, but the general consensus of viewers is that Sasha was a lone wolf, a freelance assassin exclusively loyal to Lokar. He resented having to lug Bazda, an inexperienced officer and possible liability in combat, along with him on his mission to kill Burnett. For the most part, the film is loosely based on the experiences of U.S. Air Force Captain Scott O'Grady. In June 1995, during the war in Bosnia, O'Grady was patrolling Bosnian airspace in part of a NATO-enforced no-fly zone and was shot down by Bosnian Serb forces near the town of Mrkonjic Grad. O'Grady spent six days in Bosnian Serb-controlled territory before he was rescued by US Marines. O'Grady subsequently filed a suit against the film's producers for defamation and for making a movie about his ordeal without his permission. The case was ultimately settled out of court. Nevertheless, the events of the film differ from O'Grady's experiences, such as that he never engaged in combat with his pursuers, nor did he enter populated areas. Viewers who have seen Behind Enemy Lines have also recommended Savior (1998) (1998) in which an American fights in Bosnia as a mercenary, and Harrison's Flowers (2000) (2000) in which an American woman travels into Yugoslavia during the troubles in an attempt to find her journalist husband. No Man's Land (2001) (2001) is a Bosnian-produced film about the War that won the 2002 Academy Award for Best Foreign Language Film. Lepa sela lepo gore (1996) (Pretty Village, Pretty Flame) (1996) is thought of as THE definitive film about the Bosnian War. Though it takes place in Macedonia, Pred dozhdot (1994) (1994) details the stirring ethnic hatreds akin to those in Bosnia. Grbavica (2006) (2006) details, in a way, the aftereffects.